Sweaty and dusty after this Sunday softball game, Garry Marshall shoved his worn glove in his bag, stood, and stared out over the deserted softball field. "When I was fourteen," he told me, "my friend and I stood in line at Yankee Stadium to get tickets for Joe DiMaggio Day. DiMaggio was one of my heroes, so I wanted really good seats. We got them. We were right down in front. When the game started, one of the older guys from my neighborhood came down with a hot brunette and offered us twenty dollars each for our seats. We took the money and had to watch the game standing on cardboard boxes at the back of the stadium. DiMaggio hit a home run that day, and I always regretted giving up those seats. That day I learned you should never give up your dream for anything-not for money, not for a good way to impress a hot brunette." "What about for sanity?" I asked him as I sat down on the bleachers. "We face stress, adversity, anxiety, disappointment, frustration, and rejection as we chase our dream careers-especially in Hollywood." Softball is more than a Sunday afternoon pastime for this Hollywood director: it's a philosophy. "Life is more important than show biz," he reminded me as he kicked the side of the bleacher knocking the dirt off his cleats. "You have to keep balance in your life, and there's no greater way to do that than through sports." Hitting the ball hard and taking the bases fast, Marshall releases his work pressure, keeps his focus, and stops worrying about problematic plotlines. And he's good at it too. 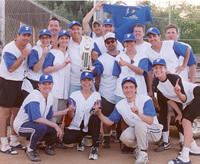 On this Sunday, his pitching led his Falcon Theater team to the Burbank Co-Ed Winter Softball League Championship. "I used to play basketball," he said, (Who doesn't remember the famous pick up games on the Marshall court? The deal for The Flamingo Kid was struck on that court. Esquire magazine called it "a legendary schmooze game." Magic Johnson and Meadowlark Lemon even played there, for goodness sake.) but, at sixty, I injured my knee. Now I play softball." My eyes traced the infield diamond, "And this, hitting balls and running bases, this keeps you sane and able to focus on pursuing your dreams?" I turned to him, and his steel blue eyes looked levelly into mine. "Yes," he said . . . without hesitation. "I like softball because it helps me deal with the biggest stress of show business: ambiguity. In softball, you're safe or you're out. You win or you lose. You know the outcome right away. Nobody says to you, 'we may pick it up in the fall' or 'we're still auditioning, we'll let you know'." The sprinklers came on in the outfield, the sun dropped below the trees, and the last mini-van pulled out of the lot. I knew it was time to let him go. "One last thing," I said, pulling his book, Wake Me When It's Funny, out of my bag. "Would you mind signing this?" (Here in front of me was the creator of Happy Days, Laverne and Shirley, and Mork and Mindy, after all. Do you think I could let this moment pass?) "Of course," he said graciously, "do you have a pen?" I handed him my favorite Pilot. He scribbled across the page and handed both back. We said good-bye, and, as he walked away, I opened to the title page and read his message. In black stretching scrawl, he wrote, "I wish you all 'Happy Days' in your life." "Oh no," I thought, "I guess I better sign up for a softball league first thing in the morning."